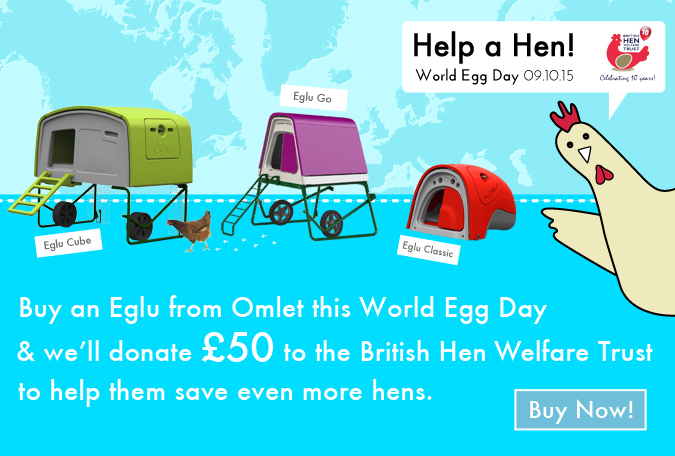 Buy an Eglu this World Egg Day and Help a Hen! Having supported the British Hen Welfare Trust for many years now, we have decided to do something eggstra special this World Egg Day. To celebrate the humble egg, the awesome chicken and 10 years of the BHWT, Omlet are going to donate money from every Eglu sale this World Egg Day to this marvellous organisation. Order an Eglu today and we will donate £50 to the BHWT! That’s £50 for every Eglu Go, Eglu Go UP, Eglu Classic and Eglu Cube Chicken Coop sold today! Established 10 years ago, the BHWT saves hens from slaughter by rescuing them at the end of their commercial laying life and finding them caring homes around the country. As well as rehoming hens, they educate consumers about caged eggs in processed food so they can make an informed choice when shopping and they actively promote Great British Free Range Farmers. The BHWT’s work to increase consumer awareness has led to big names, such as Hellmans, switching to free range eggs in their food products. These policy changes have improved the quality of life for tens of thousands of hens. The BHWT have also played a role in improving veterinary care of backyard chickens by facilitating the training of vets across the country. 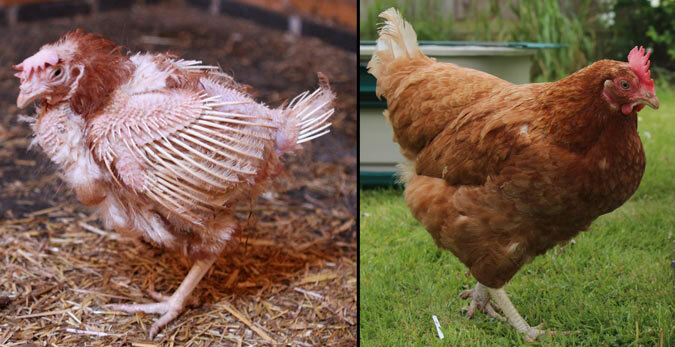 To date, the British Hen Welfare Trust has rehomed 486,192 chickens that have gone on to have happy, healthy lives, just like Lily, in the photo above. She was rescued by an Eglu owner earlier this year and after just eight months and a little TLC, she is looking fabulous and laying eggs every day. All in all, our pals at the BHWT are good eggs! 20 Eglus sold = £1,000 – enough for 40 new crates to transport hens. 50 Eglus sold = £2,500 – enough to set up two new teams with necessary equipment including crates, feeders, drinkers, hen first aid kits, banners, tshirts, stationary etc. 70 Eglus sold = £3,500 – enough for a standard, open trailer to transport 480 hens, with a customer-made tarpaulin that keeps hens ventilated. 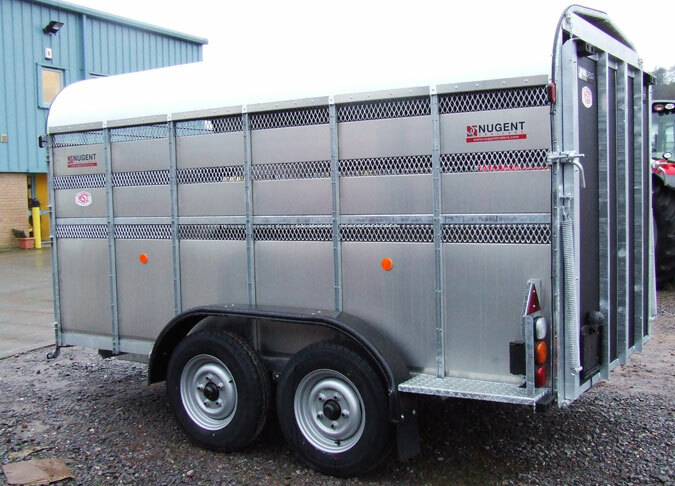 100 Eglus sold = £5,000 – enough to buy a larger, fully enclosed stock trailer that can carry up to 600 hens. So what are you waiting for? …. Buy an Eglu today and help a hen! This offer is valid from 12:01am until 11:59pm on the 9th October 2015. Previous purchases are not eligible for this offer. This offer applies to UK orders for Eglu Go Chicken Coops, Eglu Go UP Chicken Coops, Eglu Classic Chicken Coops and Eglu Cube Chicken Coops. Orders that are later cancelled will not be eligble. Omlet Ltd, Tuthill Park, Wardington, Banbury, Oxon, OX17 1RR.